How can we develop an IoT from a citizen’s perspective? What kind of projects have empowered citizens and what does it take to get these kind of projects of the ground? Those were the central questions we addressed at our panel at Thingscon 2017 that I had co-organized with Iskander Smit. 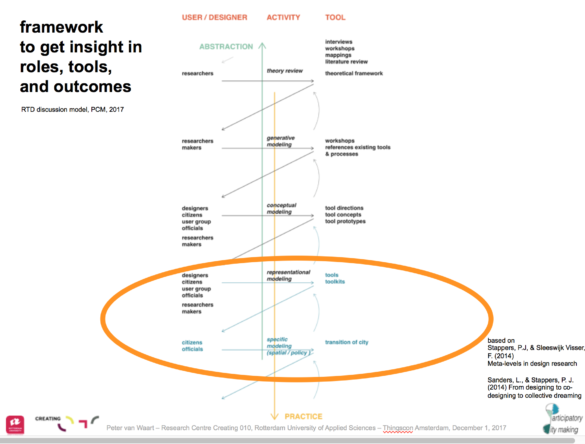 Point of departure was to look at the design and implementation of IoT not from a technological but rather from an organizational and societal perspective. First up was Jiska Engelbert from the Centre for Bold Cities, who approached the theme from the level of the frames and visions on smart cities and citizens. These frames are important as they are do not just appear as words on paper or in powerpoints at numerous smart city exhibitions staged across the world. These frames inform policy, research and funding opportunities and thus set the stage for the actual development of IoT and smart city technologies. At these conferences, Engelbert, noted, the ‘citizen perspective’ has increasingly gained popularity. But what exactly is meant with it? Mostly, she concluded it is addressed from an economic, creative city perspective. Cities are framed as sites of opportunity, where citizens in start-ups, living labs and light-house projects contribute to finding solutions for particular problems and built business models around these. In turn, this is framed as an opportunity to make cities more competitive and attractive as sites for large tech companies. This frame often arrives at the expense of addressing social problems in cities, such as unemployment, social exclusion, debts, loneliness, etc. Currently, finding opportunities to address these issues in research and development projects for IoT is very hard, Engelbert concludes. Most grants and policy frameworks see the city as an object that we can improve upon with technology, rather than as a social system. They also require co-investment from companies and/or results that are up-scaleable rather than address situated social problems. 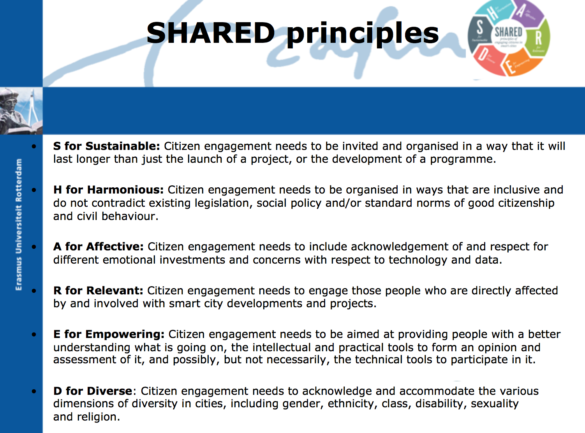 So in her view, in order to come to a truly citizen centerd smart city and IoT research and development agenda, these frameworks need re-adjustment from smart to shared: Sustainable, Harmonious, Affective, Relevant, Empowering and Diverse. In the next two talks we zoomed in to the level of the supporting infrastructures that cities would need to support a citizen centered IoT. Hanna Niemi-Hugaerts, the IoT Program Director at the Forum Virium Helsinki gave an overview of the projects they had undertaken. They have been active at a number of levels. Inclusivity Forum Virium has organized numerous workshops in which citizens were invited to discuss possible futures for their city. These workshops were accessible for people without any knowledge about the technologies itself. The goal was to get the input of a broad group of citizens in the drafting up of an agenda and vision on the role of technologies in urban life. Capacity building Next, for those who were interested in becoming more active in the actual development, Forum Virium organized workshops in which they could develop skills such as data gathering through crowdsourcing; There are many neighborhood groups that are interested in measuring air quality or traffic in their surroundings, but don’t have the actual skills yet. Data consent management system Finally, in order for citizens to trust IoT services and give them agency over their relation with IoT services, Forum Virium has been contributing to the development of the My data ‘consent management system’. This is an easy to understand/use application that citizens could use to interface with various IoT and Smart City Services in the city. The main principle is that citizens should always have control over their data. At the same time, this platform enables interoperability of various data between platforms. Next-up was Peter van Waart, researcher at the Rotterdam University of Applied Sciences and part of the Participatory Citymaking research-through-design project. This project addresses citymaking from an urban transition perspective. In this vision, cities are mostly run through a ‘patchwork of regimes’. These are institutions like local governments, housing associations and the like that have established sets of rules and ways of doing and organizing. At the same time, at the level of the everyday lifeworld of citizens, there are numerous ‘niches of novelty’. Groups of citizens or collectives who have organized themselves around particular issues like energy transition. They often have found new and innovative ways to address urban issues. However, often their ways of doing and seeing the world does not match with the ways of working of the existing patchwork of regimes. 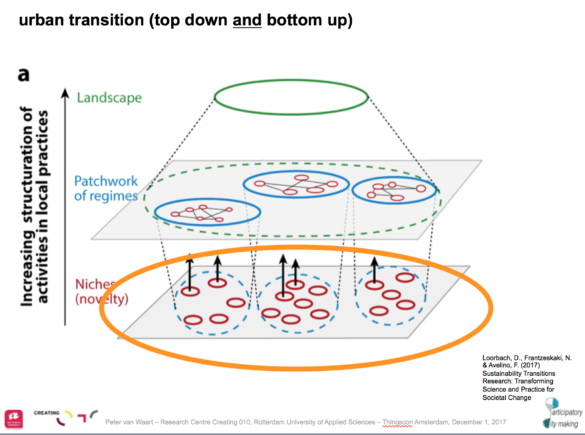 In order to make the leap from these niches of novelty of the patchwork of regimes, new modes of organizing and new roles for professionals are needed. On the one hand, design thinking (e.g. through prototyping) could play a role at the level of bottom-up initiatives in order to start discussions around issues that are of importance to citizens. On the other, new ways have to be found to ‘institutionalize’ the innovative approaches of these initiatives if indeed they contribute to public value creation. The Participatory Research-project has drafted a model to get a grasp of these new relations. Last speaker in our panel was Mara Balestrini, the CEO of Ideas for Change, and an HCI-researcher that has been involved in many projects that have aimed to empower citizens, such as Making Sense and Salus. Balestrini sees herself as a ‘community orchestrator’, possibly one of the new roles mentioned by Van Waart that have arisen in the process of collaborative citymaking. Community Orchestrator’s help local communities to identify an issue, frame it in a particular way so it resonates with potential community members as well as with policy makers and other institutional parties and helps in the design of tools and processes that can activate a community around the issue. 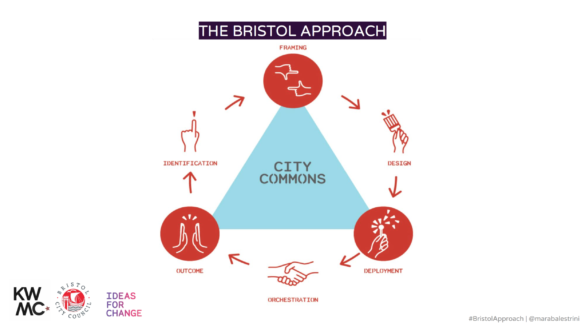 She calls this the Bristol Approach, after the city where she deployed it in a project on participatory city sensing. There, through a number of workshops, interviews and analysis of data, it was found that damp housing was considered a problem by a number of citizens. This issue was further developed in a number of framing workshops, in which participants starting to address themselves as the ‘dampbusters’, a term that provided them with a sense of common identity and purpose. To gather data about the issue, in a series of workshops a specific sensing tool was fabricated. 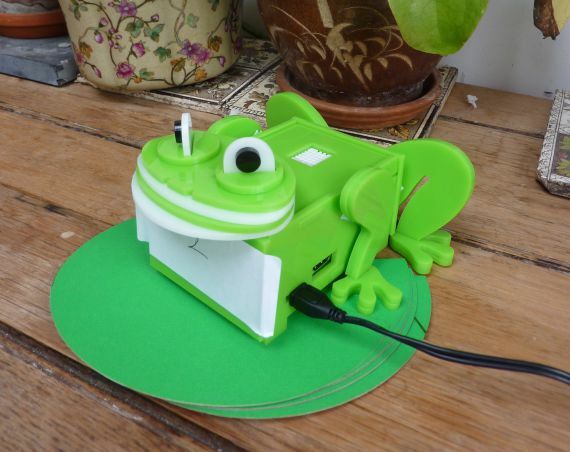 It consisted of a technical sensor, but also of a model of cute looking frog that could be easily fabricated through 3d printing technologies, and that could house the sensor. Balestrini stressed that this ‘affective’ approach was important, as it helped people to relate more intimately with the technology and adapt it in their everyday lives. The photogenic image of the frog-sensor also was helpful in gabbing attention from mainstream media attention for the issue of damp housing. In the Making Sense project Balestrini and her co-researchers followed a similar approach at the Placa del Sol in Barcelona. Here noise was considered a huge problem by the residents around the square, as crowds of people hang out at the square at night, drinking and having a good time. Again, here residents were involved through a number of workshops to discuss the issue and develop collaborative sensing technologies to measure the levels of noise that kept them awake late at night. Here, the issue was reframed as a health issue, rather than just one of discomfort. Scientific research has shown that exposure to high levels of noise can lead to various health problems. It was this particular framing that made it easier to get access to policy makers and engage in discussions about the issue. In the end, thanks to this project, measures were taken to make the square less attractive to drinking crowds. What the examples Balestrini brought in show is that IoT technologies can play a role in the empowerment of citizens around particular issues. In these examples this worked out well thanks to the role of community orchestrator. This role consists of organizing the community to identify relevant issues, frame it in ways to make sense to the community itself as well as institutions that need to be engaged to solve the problem, and help designing affective and engaging technologies and processes of sharing and communicating in which the community can be activated. In that way the community-orchestrator could take up some of the roles that Van Waart en Niemi-Hugaerts discussed. It is likely that this could only get of the ground in a semi-institutionalized way of working, where organizations like Forum Virium, applied research groups at Universities or independent ‘urban curators’ like Balestrini can find the means to set up the city-level frameworks as well as play a role in orchestrating the individual projects. 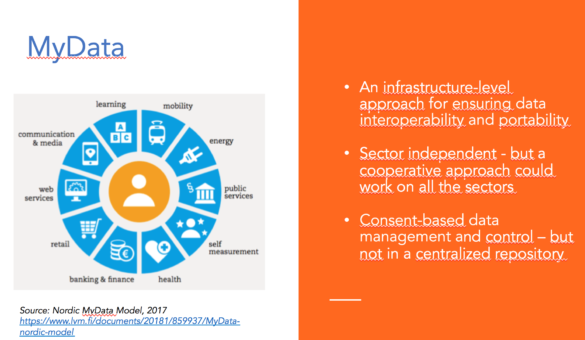 In turn, to get this of the ground, as Engelbert argued, institutional metaframeworks for Iot and Smart Cities are needed that recognize the need to address social issues through collaborative and participatory projects that are not about developing business models and scalability, but about the creation of public values.